Andhra Pradesh government is taking steps to save the water which is coming down from Prakasm Barrage. 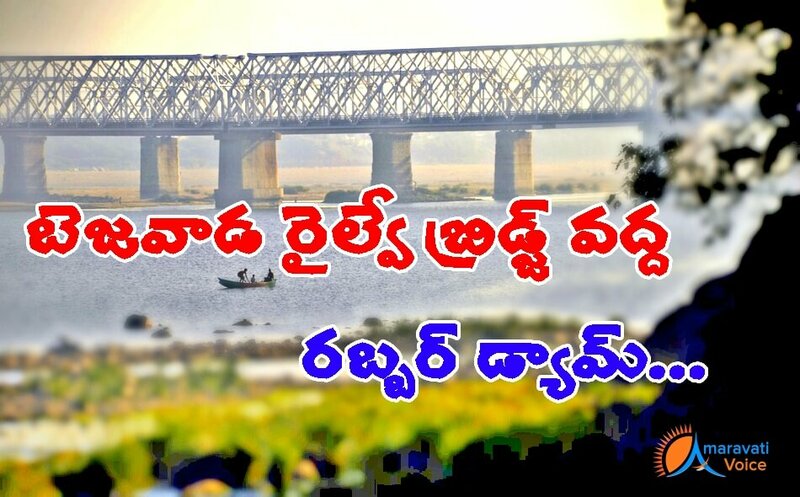 Irrigation Minister Devineni Umamaheswara Rao, along with Irrigation officials inspected Railway Bridge in Krishna River. One of the railway bridge, just have pillars and the railway track is not layed for many years. Irrigation officials has told that, water from Prakasm Barrage will be floating till here, but it is not used in a proper manner and the water is getting evaporated. They have suggested to build a rubber dam here, so that the water which is coming out of Prakasm Barrage can be stopped here and the water can be stored. This helps the ground water to increase in Vijayawada and also this water can serve the purpose of drinking water for Vijayawada. Its a nice thought. This is already implemented in India, where I found the sources in Internet. Rubber Dams: A symbol of sophistication and simple and efficient design, this most recent type of dam uses huge cylindrical shells made of special synthetic rubber and inflated by either compressed air or pressurized water. Rubber dams offer ease of construction, operation and decommissioning in tight schedules.